The structure of financial markets has changed with the rapid growth and popularity of passively managed funds. Passively managed funds can have a similar effect on the economy as systemically important financial institutions. Trading in passively managed funds may directly affect thousands of securities and have an additional indirect effect across different asset classes. Recently, the correlation among different asset classes has increased making it difficult for investors to diversify. It is fair to say that due to a greater popularity of passively managed funds their influence to move markets is significant. Passively managed funds are effective tools to move markets, but they are not the direct cause of increased volatility. The behavior of financial markets is partially driven by heuristic and biases. Heuristic helps investors to make quick decisions based on mental shortcuts and turns passively managed funds into effective vehicles for short-term bets. Investors should recognize the bandwagon effect and heuristic biases: such as, loss aversion and representativeness. Together with popularity of passively managed funds heuristic biases may significantly increase volatility of financial markets. As a result, today’s financial markets are more volatile and react quickly on new information. This new behavior and new structure of financial markets create challenges and opportunities. At the end of the article, you will find six principles of investing suitable for current market conditions. The popularity and growth of passively managed funds is attributable to their many benefits. Passively managed funds have low cost due to a simple replication strategy which does not require as much resources and skills as active management. Fidelity Spartan 500 Index Institutional share class has an expense ratio of 0.04%. By paying 0.04% a year, investors can diversify among 500 companies and earn similar return to S&P 500 Index. Investors may also trade many passively managed funds commission free. This reduces the cost drag on performance to small investors. Also, there is no active risk exposure since the main purpose of passively managed funds is to provide a similar performance to their benchmark index. There is no surprise why a simple, inexpensive and easy to understand product became so popular. The amount of money invested in passively managed mutual funds has surpassed the assets in the actively managed mutual funds, and trading volume of ETFs is equal to one-third of all trading (Sullivan and Xiong 2011). The popularity of passively managed mutual funds made Vanguard Total Stock Market Fund the world’s largest mutual fund. As of April 23, 2014, the total assets of Vanguard Total Stock Market Fund were worth 323 billion US Dollars according to Morningstar. Due to recent structural changes in financial markets, the traditional diversification benefits from owning different asset classes are not as high as they used to be. Betas for all four different asset classes (small, large, growth, or value) have increased in recent years weakening diversification benefits between different asset classes (Sullivan and Xiong 2011). For example, during the recent financial crisis of 2008, the performance of four different asset classes became positively correlated, reducing any diversification benefit so important during a recession (see table 1). With great weight comes great influence. Sullivan and Xiong (2011) showed how the increase in popularity of passively managed funds may create a systemic risk to financial markets due to increasing correlation of returns between different asset classes and “basket trading” which effects hundreds or even thousands of stocks with just one trade. Since each passively managed fund is a basket of hundreds or even thousands of securities, one buy order causes a widespread effect on all securities within a passively managed fund. Today’s stock market returns likely to have a distribution curve with fat tails indicating greater number of observations away from the mean. 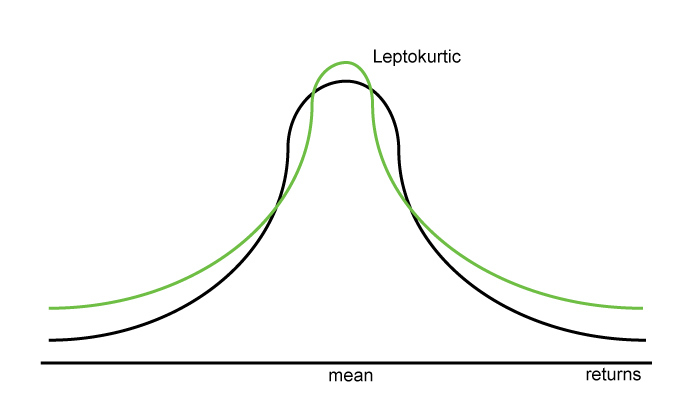 This shape of distributions is called leptokurtic and is displayed in green color on the illustration below (see Figure 1). Passively managed funds are fast and effective ways for investors to alter their exposure to different asset classes. Heuristic biases can turn passively managed funds into short-term trading products that increase volatility. Investors are subject to loss aversion and are likely to sell positions when prices are down in order to limit their losses. Loss aversion expresses the intuition that a loss of $X is more aversive than a gain of $X is attractive (Daniel Kahneman and Amos Tversky, 1984) For example, an individual investor who decides to invest $80,000 of savings into the stock market will experience greater pain from losing 20% or $16,000 the next day than an alternative satisfaction he/she will receive from earning $16,000. In today’s market, loss aversion can cause a sell-off in under-performing passively managed funds that will have a widespread effect on a broad market. Representativeness heuristic explains how investors base their predictions on descriptions and recent data instead of personal beliefs and fundamental analysis. For example, a favorable description of strong quarterly earnings by media together with a recent increase in stock prices may incline investors to issue a buy recommendation. If investors predict solely in terms of the favorableness of the description, their predictions will be insensitive to the reliability of the evidence and the expected accuracy of the prediction (Amos Tversky and Daniel Kahneman 1974). Representativeness may cause bubbles in financial markets. Another explanation of why stock market bubbles occur is given by the phrase “jump on the bandwagon.” It means to follow a popular opinion regardless of personal beliefs. When stock prices increase, more people want to participate in the rally and “jump on the bandwagon.” Since such investment decisions are based more on historical price movements rather then on investors’ opinion or fundamental values, bandwagon effect may explain why some stock market bubbles occur. Because of the loss aversion, representativeness, and “jump on the bandwagon,” investors are inclined to make quick decisions without using their personal opinion and fundamental analysis. If such investors turn to passively managed funds to place trades, their decisions have a widespread effect on the overall financial market. Self-fulfilling prophecy takes effect when many investors follow a popular opinion and move a broad stock market in a common direction. At some point in the future, the stock prices will return to their true value. Such behavior creates volatility. a) Determine appropriate asset allocation based on risk tolerance and long-term time horizon. Original asset allocation should have comfortable risk exposure. Today’s markets are more volatile in nature which can be perceived as risky by some investors and prevent them from market participation. Such risk averse investors may not be able to grow their savings and will likely experience a real decline in their purchasing power and wealth over time. Instead of avoiding the financial markets, long-term investment strategy that provides comfortable short-term volatility should return investors’ interest to financial markets. b) With increase in correlation between different asset classes, their diversification benefit has declined. Investors should understand potential large short-term downside risk to their portfolio and keep focus on the long-term horizon. Those investors who are uncomfortable with short-term volatility would be wise to invest in a more conservative asset allocation strategy. c) Since today’s market volatility has increased, investors are more likely to become victims of loss aversion bias – sell when the market is low. These investors will not participate in a future stock market recovery. Instead of selling when the market is down, investors should rebalance their portfolios to the target allocation. Sell offs should be seen as buying opportunities rather than panic episodes to investors who do their homework and research stocks. d) With increased volatility, more strict rebalancing rules are prudent to implement. Rebalancing will capture the benefit of increased volatility and will keep the overall asset allocation close to the target. e) The size of the portfolio matters, the smaller the portfolio, the less risk it can usually afford to take. The larger the portfolio, the more risk it can take, holding everything else constant. f) Popularity of passively managed funds may also slowdown the speed of price discovery. Passively managed funds do not differentiate between underpriced and overpriced securities but invest in the entire basket of securities. Active managers will have more opportunities to find good values but will also require longer time to generate positive alpha. These are few observations that may help investors to meet today’s challenges and take advantage of benefits that passively managed funds and heuristic biases have created. This paper was written as an opinion only. The data is not guaranteed to be accurate or complete. Please consult with your financial advisor before making an investment decision. Any investment decision that results in losses or gains made based on any information on this website is not the responsibility of ECNFIN.COM or authors of articles published on this website. Daniel Kahneman and Amos Tversky. “Choices, Values, and Frames.” American Psychologist. Vol. 39, No. 4, p. 341-350. April 1984. Daniel Kahneman and Amos Tversky. “Judgment under Uncertainty: Heuristics and Biases.” Science. New Series, Vol. 185, No. 4157, pp. 1124-1131. September 27, 1974. Nice paper! I enjoyed it. Good to see you last week. Hi Carter, it was great to see you as well. Thank you for following my blog. Let me know when you are in Colorado next time.